It was in last January when I first wrote about the invasive pest Bagrada bug (Bagrada hilaris). It was only reported in Imperial, Riverside, and Orange Counties at that time. 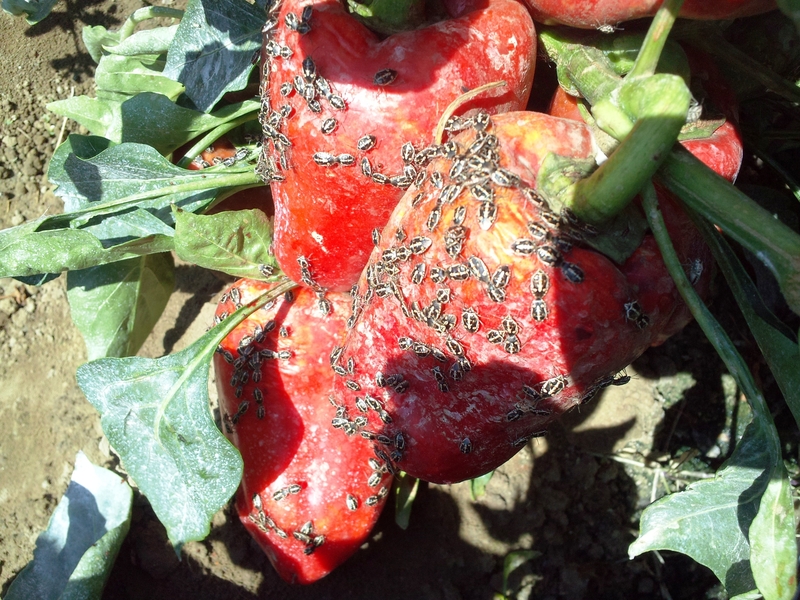 In the past two months or so, I have received several phone calls and emails from various places outside Santa Barbara County about Bagrada bug infestations in the home gardens and fields on arugula, broccoli, kale, Monterey pine, mustard, peppers, radish, and strawberries. In some cases, they were also seen inside the homes. Early this week, Santa Barbara County Ag Commissioner Entomologist, Brian Cabrera received specimens from Solvang and found infestations of Bagrada bug on mustard in other areas making an official record of this pest in the county. This pest currently has a B rating by CDFA. 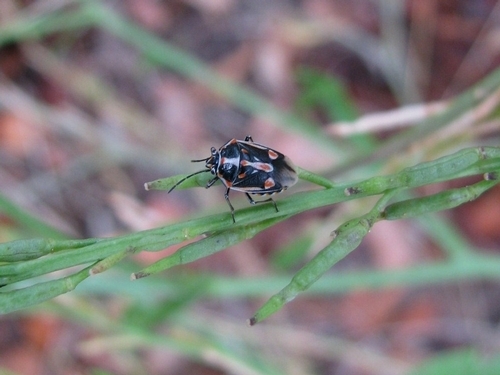 Like lygus bug, Bagrada bug can also migrate to crop plants from alternate hosts such as wild mustard. So, proximity to such wild hosts can lead to possible infestations when wild plants dry out. Management options: There are varying reports on the effectiveness of various products especially for organic crops. Someone reported effective control with mechanical exclusion and azadirachtin. However, University Arizona Entomologist, John Palumbo did not see effective control by organically approved products when compared to the combination of dinotefuran and bifenthrin in his studies. Cultural control through pest monitoring and early detection, removal of weed hosts, mechanical removal through handpicking or vacuuming, cultivation to destroy eggs in the soil, and overhead irrigation to dislodge nymphs and adults from the plants are some of the options suggested in the literature. If you see Bagrada bug, please contact me or your local Ag Commissioner's office. Surendra, in August I was shown the first infestation I have ever seen at Pilgrim Terrace Community Garden, broccoli plants crawling with them. The gardener removed those plants completely. Then the neighboring plot had them. I have had some on mine, and am hand picking daily. I am following the Infonet-Biodivision information: http://www.infonet-biovision.org/default/ct/103/pests because Infonet is in Africa, one of the places the bug comes from. They already have experience with it. Locally, Santa Barbara, organic farmer John Givens recently lost an entire bok choy crop to them. Thanks for letting me know about the infestation in your area. My articles are based on a variety of scientific literature including current information appropriate for our situation. It is a good thought to look at African sources because of the pest’s origin. However, the response of a pest to various treatment options changes as it adapts to its new environments. It is better to consider US or North American sources for management options especially for specific products and their local registration status. Good point, Surendra! My training is to combine techniques, use several. In this case, with the instant and overwhelming infestations, I can't personally emphasize enough to check your plants daily. I did take the African advice, divided and planted smelly plants - bunch onions, society garlic, garlic chives - between my Brassicas.